Chocolate chips, chopped pecans and creamy caramel come together in these chewy oatmeal bars. 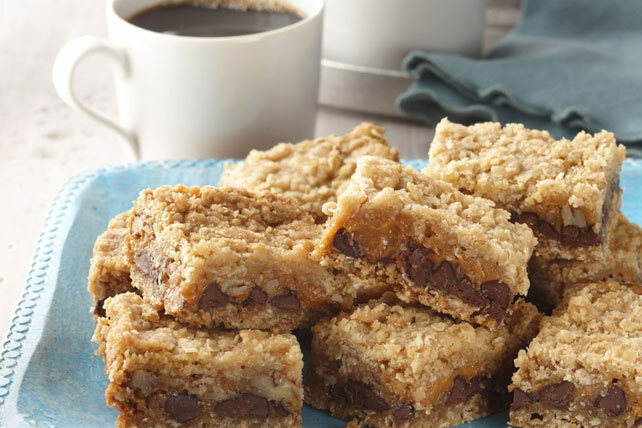 This big batch of baked bars is perfect for bake sales, family get-togethers or potlucks. Line 9-inch square pan with foil, with ends of foil extending over sides; spray with cooking spray. Cook caramels and milk in saucepan on low heat 2 to 3 min. or until caramels are completely melted and sauce is well blended, stirring frequently. Remove from heat. Mix flour, oats, sugar, baking soda and salt in large bowl. Cut in butter with pastry blender or 2 knives until crumbly; press half onto bottom of prepared pan. Bake 10 min. ; top with chocolate chips and nuts. Drizzle with caramel sauce; sprinkle with remaining crumb mixture. Bake 20 to 25 min. or until golden brown. Cool completely. Use foil handles to lift dessert from pan before cutting into bars. Substitute walnuts for the pecans. To prepare caramel sauce in the microwave, place caramels in microwaveable bowl. Add evaporated milk. Microwave on MEDIUM 5 min. or until caramels are completely melted and sauce is well blended, stirring after 3 min.